After almost two decades of uneasy peace, war has returned to Kachin, a resource rich region in the far north of Burma. KACHIN BORDERS CHINA, and the current fighting broke out near controversial Chinese hydropower projects. The Burmese government approved these projects and promised to provide security around the dam sites, but the dams are opposed by most Kachin people, whose homelands will be impacted by the flooding and who will not see much of the money or power produced by the dams. In December, 2008 I spent one month in Kachin working as a journalist alongside the photographer, Ryan Libre. Ryan and I were guests of the Kachin Independence Organization (KIO) whose military wing, the Kachin Independence Army (KIA), is now at war. In Laiza spirits are high. There is a vibrancy in the air and the KIA/KIO leadership talk of their options with optimism. Many civilians have huddled into churches and makeshift refugee camps right on the Chinese border. Those left in the city do not look scared. The KIA is the third largest army in Burma, but their forces are massively out-numbered and out-gunned by the Burmese military. Their survival hinges on a dual strategy of intensive public relations and determined guerrilla warfare. Fighting can buy the Kachins time, but their long-term success depends on diplomacy, international awareness, and political legitimacy. There is no freedom of speech in most of Burma, where the government controls the media. In contrast, the KIO promotes a free press, invites foreign reporters into its territory, and encourages the growth of civil society. The Kachin media has covered the conflict in detail, and Kachins living outside of Burma are busily emailing each other the latest news. When the body of a Kachin soldier was returned to his base as part of a prisoner swap last week, photos showing his apparent torture went viral, landing in my inbox over and over again — first a photo of the soldier when he was alive, then images of his puffy, purple face, his arm shredded by stab wounds, a gaping hole in his belly. Finally there was a photo of an old soldier with bent shoulders looking at the young body of the dead soldier as it lay on a blanket in the dirt. Last night the Burmese government finally issued a statement about the fighting. The statement was reported by the AP and the BBC, and illustrated by a photo of a KIA soldier wearing a yellow bandana over his mouth. This photo struck me as odd, because in all my time in Kachin, on military bases, at a military academy, at checkpoints and on the front lines, I never saw a soldier wear a bandana in this fashion. Kachin is not a remote jungle backwater. The Kachin people are not tribal head-hunters or extremist insurgents, and the KIO is an established political entity. The narrative of insurgency and rebellion, though, is just as misleading as news reports that describe Kachin as tribal and remote. Kachin is not a remote jungle backwater. The Kachin people are not tribal head-hunters or extremist insurgents, and the KIO is an established political entity. The territory at stake is one of the most economically important and politically open parts of Burma, and the Kachin people are fully aware of how their situation fits within a contemporary global context. Many Kachins can speak eloquently about their political dilemma in at least four languages, including English, Chinese, Burmese, and Jinghpaw. The political leadership is expert in diplomacy and eager to develop and democratize. Their goal is to gain a political role within a federal union of Burma that guarantees human rights for all religious and ethnic groups. 3 KIA/KIO officers stay up into the early morning receiving, translating and sending information about the renewed fighting in the Kachin State. Kachin leaders like Gun Maw, a chief negotiator for the KIO, embody an alternative leadership for a new and democratic Burma. Unlike the sclerotic and ineffective domestic Burmese opposition, led by the National League for Democracy, the KIO leadership is seasoned by the experience of governing through challenging times. Historically, the Kachin quest for international recognition and political legitimacy was hamstrung by their involvement in the drug trade, but since a 1994 ceasefire — and especially in the past three years — the KIO has campaigned extensively against the cultivation, distribution, and use of opium and other illegal drugs. The Kachin gamble was that political legitimacy and international awareness would prove more valuable than money from the drug trade. Much is at stake in Kachin. The KIO is calling for Beijing to mediate the current conflict. 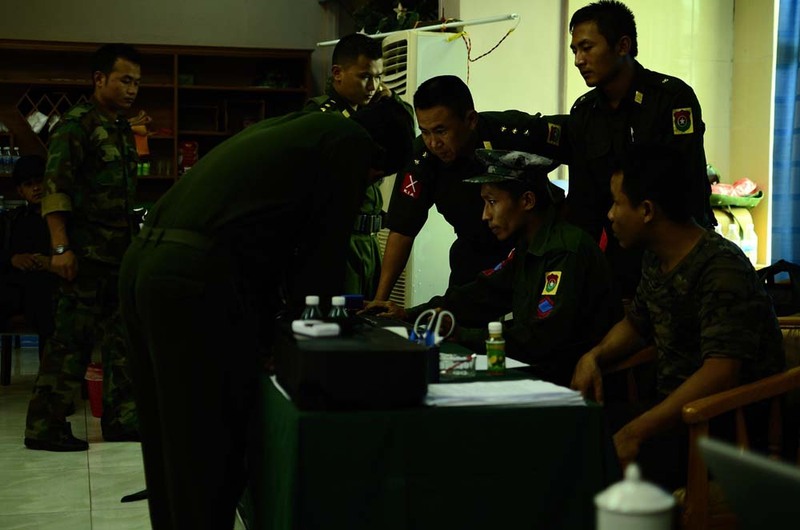 Whether or not the fighting intensifies may depend on the extent to which the front line units of the Burmese army will answer to their military command. It may also depend on the willingness of the international community to address a conflict that is playing out in China’s backyard. Author’s note: Ryan and I first visited Kachin with help from the Pulitzer Center for Crisis Reporting. You can check out our articles, video, slideshows, and blog posts at The Kachin Struggle for Freedom.